Being a Houston resident, I have a soft spot for both Six Flags Astroworld and Travis Scott. So, when Travis announced this album back in 2016, I was hyped for it, especially coming off 2015’s Rodeo, an amazing album with psychedelic production, warped, autotuned vocals, and some seriously dark vibes. My feeling towards Rodeo are no secret. I think it’s an amazing album, but neither are my feelings towards Travis’ work since then, such as Birds in the Trap Sing McKnight and his Huncho Jack, Jack Huncho collaboration with Quavo. I believe that both of these projects are Travis essentially making wallpaper music, stuff you can just throw on in the background and forget about. And, if that’s how you listen to your music, then that’s your decision, I can’t tell you how to enjoy albums. BUT, for me personally, I like to be attentive and involved with albums I listen to, and trying to be in depth with Travis’ past to projects is pointless, because there isn’t any depth there. Yeah, Birds was interesting, but it didn’t have much replay value; it came out in September 2016 and by that December, I was already tired of it. And don’t try to talk to me about HJ,JH, because that came and went immediately for me. Travis and I are from roughly the same parts of Houston, so I feel inclined to be more patient with a fellow Houstonian, but it’s for the exact same reason that I’m tougher on Travis’ music. Obvious disclaimer, Travis has racked up millions of streams, dollars, and award nominations, so it’s not like my opinions have any real weight to him, he doesn’t have to do anything to try to impress me specifically. That all being said, I was going into Astroworld hoping for something better than Birds, but expecting the worst, especially after seeing, “Watch,” was left off the tracklist, but, “Butterfly Effect,” made it on the final cut. The opener, “STARGAZING,” was a pretty nice intro (although as I write this, I realize every Travis album has had an outstanding intro song), with it’s vaguely psychedelic and dark structure. The main melody sounds like a string pad that just floats around lightly while the 808s and snare drums are booming, and overall the beat was getting my hopes back up. However, Travis’ production has never been up for debate to me, it’s always been the lyrics that were inconsistent; sometimes Travis crafts a really great story in his songs that flow, and other times we get…, “Beibs in the trap.” Yeah, inconsistent is the word. “CAROUSEL,” isn’t a bad track, but being sandwiched between an intro as good as, “STARGAZING,” and a banger like, “SICKO MODE,” it puts a lot of pressure on a track to stand out, which unfortunately it doesn’t do. Now, it does have a Frank Ocean verse going for it, and those are never flops to me, but outside of that, nothing about this track really does anything for me. In fact, the stretch of songs after, “CAROUSEL,” are an amazing run, the best on the album. “SICKO MODE,” though, now THAT is easily one of the three best songs on this album. The multiple beat switches at the front and back at this album initially felt rough and jarring, but after a few listens, they grew on me. I’m not sure who the vocalist is on this track that does the, “Someone said,” bit (it sounds like Swae Lee, but there’s no features listed in the tracklist), but they, combined with Drake and Travis’ 2-on-1 fastbreak, make this track incredibly catchy. Tay Keith gives this song a very radio friendly bounce to its percussion pieces, to balance out the moodiness that separate Drake’s part. As a whole, this song is in the sweet spot where Travis’ experimentation and dark aesthetic is still enough of a banger to be palatable to get ran into the ground by your local radio station, a balance I felt like Birds was going for, but fell short as far as experimentation goes. “STOP TRYING TO BE GOD,” is another song that, even though it doesn’t hit the same sweet spot that, “SICKO MODE,” does, is a top tier song, not just on this tracklist, but in Travis’ discography as a whole. I’ll go ahead and say that having Kid Cudi on your song only to hum is somehow both the best and worst way to use Cudi in 2018; hearing Cudi and Travis together on, “Through the Late Night,” was a great moment on Birds and I was hoping for more of that. But no, he’s just here to hum, which has become a meme now because that’s all Cudi did for a period of time, but it sounds so good that I don’t have a real issue with it being his only contribution. As a whole, it’s a great song with production that’s a blend of dark and almost ballad-like, for lack of a better word. “COFFEE BEAN,” is a smooth and laid back track to close the album. 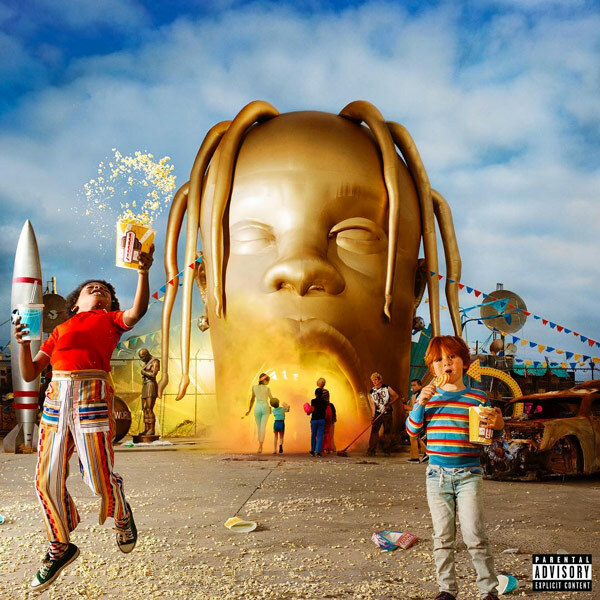 It has some of my favorite production, with the easy strings and relaxed percussion rhythm, and the lyrics seem up to par with what I had gotten used to on Rodeo as he raps about what sounds like his relationship with Kylie Jenner (though other tracks do as well, like, “STOP TRYING TO BE GOD,”) and is a strong bright spot on an otherwise middle of the road second half. So where does this leave Astroworld as a whole? Well, it has seventeen tracks, and at least two of which didn’t need to make the final cut. The first ten or eleven are either just average or really standout moments, but I’ve been thinking about why this is, and maybe it’s because Travis has been lending his sound to any and everybody who asks for a feature. Rodeo was iconic with it’s own distinct sound that no one else had, but by the time Birds rolled around, it wasn’t as fresh, and now here we are with Astroworld, which really borders on sounding played out after a few listens. Granted, it’s still better than his last two projects, in fact Astroworld probably lands as my third favorite Travis Scott project right now, but I don’t see it jumping up from that spot. His once mind blowing and ridiculous aesthetic that was made up of dark and lush production and erie autotuned vocals has become the norm for whatever is hot in rap. While I still believe Travis has more tricks up his sleeves to stay relevant and creative, it just doesn’t feel like he brought that on this album, at least not front to back like on Rodeo. So You Want To Get Into Vinyl?